Members are the foundation of HRC's strength, and there are a variety of membership options. Choose the level that best meets your needs and abilities. 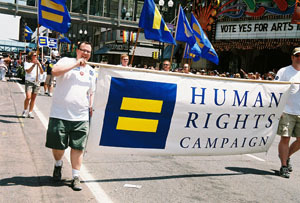 Every new and renewing member makes HRC and its programs stronger and more effective. Have you already given a one-time donation? If you’d like to do something bigger, consider becoming a monthly donor. Are you a Partner looking to upgrade your monthly pledge? If you'd like to upgrade to your monthly pledge, you can do so by clicking here. Are you a supporter who hasn't contributed recently? Renew your commitment now! You can also increase your contributions by becoming a Federal Club member. Are you a Federal Club member looking to do more? If you’d like to increase your contributions, consider becoming a Federal Club Council member. Are you a Federal Club Council member looking to do more?